Never having been to the Culver City location, I had my first experience at FraÃ®cheÂ just a couple months after mine at Riva – the restaurant that was formerly housed where FraÃ®che stands now. It would officially be my second meal with Jason Travi’s protogee Sydney Charles Hunter IIIÂ at the helm. Of course, I didn’t expect to visit the locale so soon after my dinner with other gals at Riva; at the time I also didn’t know I was dining at a place that would soon close. The surprise, however, was welcome – FraÃ®che set out to impress the Food Digger crew and succeed they did. The meal was pretty much mind-blowing. 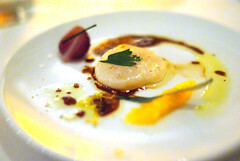 We started out with Japanese scallops with braised pearl onions, lobster glace, lemon oil and orange. A great little seafood taste in which the citrus flavors were the most potent. Combined with the sweet and sour braised pearl onion, it was the lightest take I’ve ever had on a scallop. I think the following was my favorite part of the dinner: foie gras terrine layered with prosciutto and fig purÃ©e, orange gelÃ©e, Campari gastrique and arugula. The combination of all the flavors together continued on the citrus note with the orange gelÃ©e. 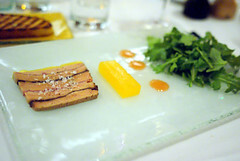 Adding to the richness of the foie gras terrine were the sweetness of the Campari gastrique drops and the sour greenness of arugula. The dish essentially touched upon all corners of my mouth – however many there actually exist. 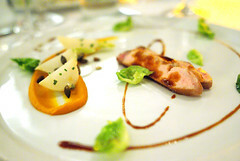 The flavors were absolutely titillating but the textures in the components brought the dish full circle. Our first fish dish of the night, John Dory, was tender, subtle and appropriately complimented by subtly sweet pearl onions, baby turnips and carrots. 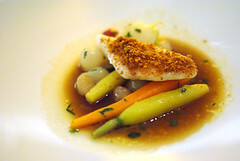 The toasted brioche crumbs were a finishing crispy texture that was able in accenting the delicate fish. The tasting menu coordinated a heavier fish to follow and I, in my limited consumption capacity, was just happy to be hangin’ tough. (Folks, she’s learning to pace herself.) We were blessed with absolutely stellar wine pairings that brought an added dimension to each singular dish and I couldn’t wait to see where the story would take us. 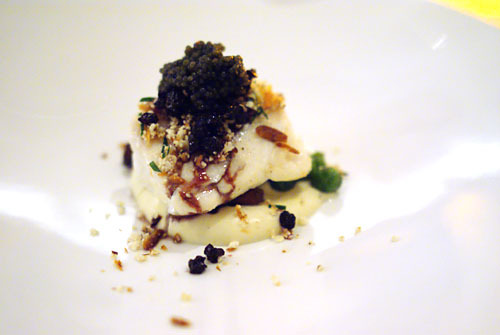 Cue the halibut – topped with Paddlefish roe and nestled in cauliflower caviar, peas and chanterelle stuffed inside the filet (see above). By the way, this was an added, impromptu selection and not originally on our tasting menu. It was a full, savory fish dish and everyone was thankful to be subject to a successful experiment. 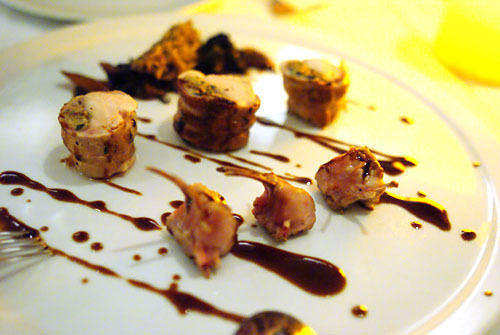 I haven’t had much experience with rabbit but this dinner had me reassessing the desirability of it – it was way less gamey than I remember the meat tasting. The thing about it was, I enjoyed it in all three forms it came in: on the rack, in the saddle and as confit. It was super tender and especially the confit and surprisingly even in the saddle was it packed with a very full flavor. On the rack was the cut I enjoyed the most, as I felt I was really experiencing the meat it in its original form – saltier than the others but still just as delicious. It tasted better than chicken. And now back to our regularly-scheduled menu was Kurobuta pork two ways. They were brought out at the same time and complimented each other completely. The bone-in chop was tender, full and went perfectly with the sprouts and barely-sweet butternut squash purÃ©e brushed onto the dish. Contrasting that was another Kurobuta pork dish that was decidedly sweet and savory: This time it was wood fire braised loin, lentils, carrot sauce and ginger-honey emulsion. I love both lentils and brussel sprouts, but the lentils appropriately grounded the sweet bowl of braised loin – it was like a soup with a sort of gravy texture, indicative that we were heading towards dessert. The meal overall wasÂ Ã¼ber. The pairings were perfect and we were shown the utmost in service. But the experience has me curious as to what a second, more casual and incognitoÂ visit might bring. It would definitely be worth it to find out. This entry was posted in Food, Santa Monica and tagged Californian, Fraiche, French, Jason Travi, Mediterranean, restaurant, Santa Monica, Sydney Charles Hunter III. Bookmark the permalink.